Have you heard the term “tourist winery” before? I didn’t, but now I have. Follow along, I will explain. Recently, the subject of the wines of 50 states came back into my focus – after tasting wines from Vermont, Colorado, Texas and Connecticut, it was kind of easy to get carried away, right? When we arranged a short weekend getaway with family in Newport, Rhode Island, I decided to check on the wineries on Rhode Island. Yes, the almighty google said, there are a few on Rhode Island, and one of them, called Newport Vineyards, is about 20 minutes away from the downtown Newport. My wife likes to visit wineries, and kids are old enough to sustain at least one winery visit, giving me only a reasonable amount of hard time, so our first destination of the trip was set. Finding our destination was easy – a long building with clear sign, adjacent vineyards and very substantial parking lot ( I understand they got land, but still). Walked in, waited a bit in the lane and bought a ticket for the tasting ($12 allows you to taste 5 wines, or you can pay $15 if you want a logo glass). The tastings were happening in the multiple locations, both inside and outside. We settled for the tasting bar on the second floor, as the crowd appeared to be smaller than in the other places. Before I will talk about the wines, let me tell you a few things about the winery which I picked up from the back and forth conversation with our pourer (it was back and forth as we couldn’t just stand and talk – he had to serve the other guests as well). The winery was founded in 1988. 70% production are the white wines. Winery makes about 22,000 cases a year, primarily from the estate grapes. The mix of grapes is somewhat eclectic, at least judging by the wines of neighboring Connecticut and Massachusetts – for the whites, in addition to Chardonnay, Riesling, Vidal, Cayuga and Seyval Blanc, the winery also grows Sauvignon Blanc and Pinot Gris. The red grapes include Merlot and Cabernet Franc, which are both pretty standard for New England, but Cabernet Sauvignon and Pinot Noir are not so much. Additionally, Newport Vineyards makes single varietal wine from the hybrid grape called Landot Noir – will talk about this wine later. The soils are heavy clay loam (just as a statement of fact – I can’t tell you how does it affect the taste of the wine). Here is the part of our conversation which I found most interesting. As you know, I’m a big fan of the aged, older wines, and I’m always looking for an opportunity to taste them. If I can’t taste the older wines myself, at least I would like to hear what the winery staff thinks about aging of their own wines, what was was the oldest vintage they ever tasted, what do they think about aging of the current release. Any and all of my inquiries were met with the stern “we don’t do do it”, “no, I have not”, “I never had”, etc, until the phrase came “we are a tourist winery. We have 50,000 people visiting winery every year, and all of our current releases sell out”. This was definitely a revelation for me. I always associate winery existence with utmost passion, borderline obsession to create great wines just for the art of creation (I understand that winery is a business – wines should be created and sold – don’t grab on this, please) – and I always thought that tourists were an afterthought to the winery’s existence. Now, having heard the term almost as an official statement (of course this is not a statement from the winery), that makes me think – yes, I can come up with more examples of the “tourist wineries”, based on my experiences in Temecula Valley and Connecticut. With that concept in mind, I can now better understand the logic of some of the winery decisions which appear puzzling otherwise. Talking about learning new things, I also learned about new AVA – Southern New England AVA (SENE AVA), which stretches along the Eastern coast of US from Coastal Connecticut through Coastal Rhode Island, South Coast of Massachusetts and into the Cape Cod and the islands. SENE AVA was defined in 1984, so it celebrates 30 years this year. All together, the wineries form the Coastal Wine Trail (here is the link to the web site). There you have it, my friends. Definitely an interesting and learning experience. 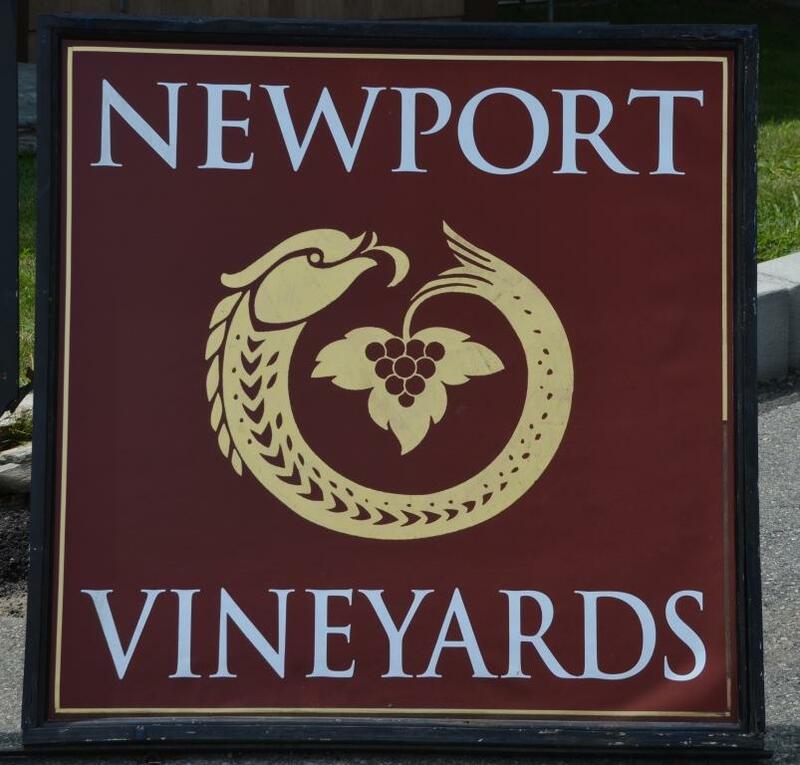 If Newport is in your travel plans, stop by the Newport Vineyards, I’m sure it will worth your time. Cheers! I visited the Wine Cheese and Chocolate Fair sponsored by the Coastal Wine Trail back in June and was surprised at the number of wineries in the MA and RI area. CT’s Stonington Vineyards is a member, as well. Sounds like you had an eye opening experience but a good time as well. Cheers Anatoli! Thanks Bonnie. Yes, it was a very interesting experience for sure. Live and learn!